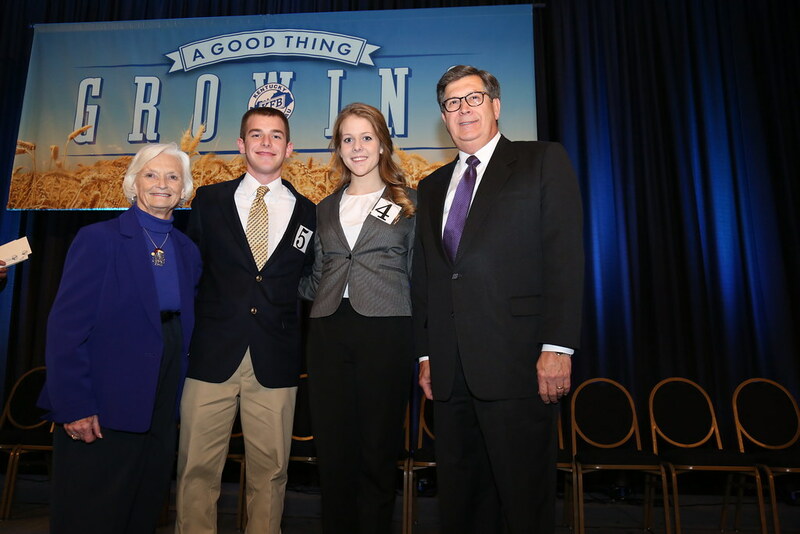 Louisville, KY (December 4, 2015) – Benjamin Pinkston of Mercer County, and Reagan Miller of Warren County were awarded top honors in the 2015 Outstanding Farm Bureau Youth contest. Both winners were recognized during the December 3 general session of Kentucky Farm Bureau’s (KFB) 96th annual meeting, held at the Galt House Hotel in Louisville. Benjamin Pinkston of Mercer County (left center) and Reagan Miller of Warren County (right center) received the 2015 Outstanding Farm Bureau Youth awards from Betty Farris, Chair of KFB Women's Committee (left) and David S. Beck, KFB Executive Vice President (right). Pinkston and Miller were selected from 22 district finalists out of approximately 400 young people who competed in county and district contests over the past several months. Judges met with finalists for personal interviews during the annual meeting, awarding points for each contestant’s leadership record, conversational ability and scholastic achievement. KFB gave both Pinkston and Miller a $2,000 college scholarship, an expense-paid trip to Washington, D.C., on the KFB Congressional Tour in February 2016, a luggage set and watch for winning the contest. Runners-up in the contest were James Payne of Henderson County and Gracie Furnish of Harrison County. They each received a $200 cash award and digital camera from KFB. Congeniality awards, which were voted on by their fellow contestants, were won by Wyatt Wood of McCracken County and Gracie Furnish of Harrison County. KFB awarded both of them with $100 cash prizes for the honor. The 22 district finalists who performed at KFB’s annual meeting included: Elizabeth Brown and Wyatt Wood, McCracken County; Bailey Peterson, Muhlenberg County; James Payne, Henderson County; Shelbi Pendergest, Grayson County; Blake Quiggins, Hart County; Reagan Miller, Warren County; Braden Burks, Barren County; Emily Hamilton and Benjamin Pinkston, Mercer County; Micheala McCane and Alex Wheatley, Franklin County; Sarah Harne, Casey County; Zachary DeBord, Pulaski County; MaKayla Campbell and Tanner Erlandson, Lincoln County; Gracie Furnish, Harrison County; Zachary Plummer, Fleming County; Miranda Robinson, Greenup County; Ethan Wells, Pike County; Emily Hayre and Travis Lewis, Laurel County. All 22 contestants received luggage pieces and $100 for winning district competitions.